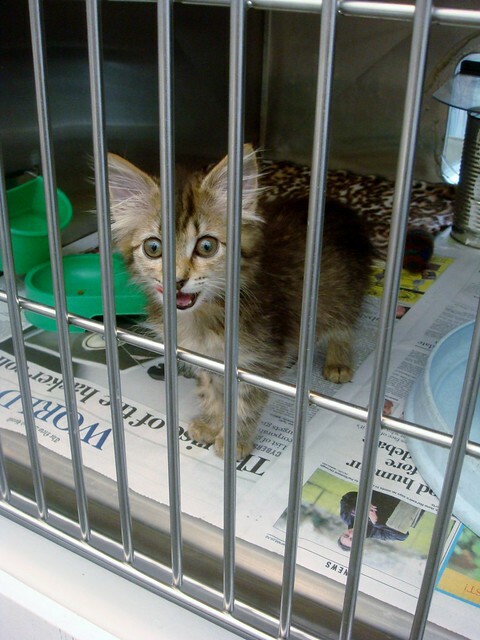 A few days ago I had the honour of raising funds for the New Zealand SPCA. The reason I am so honoured is because my sweet little kitty, Pecan, was adopted from the SPCA and I am forever grateful for her. The last two years I have been too busy to participate in the SPCA Cupcake Day but this year I was determined to make something yummy and fun to raise funds. I made two batches of cupcakes to take to uni and Mr S's work, red velvet cupcakes and French toast cupcakes. Both went down a treat (people were thrilled to eat bacon with a cupcake) and I managed to make $145! 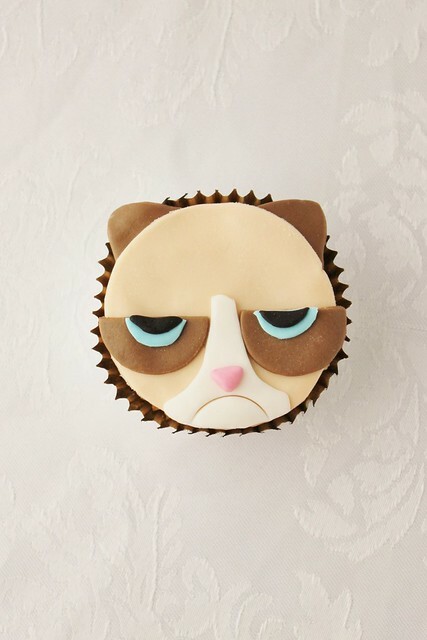 I also decided to make my favourite Internet meme kitty into cupcake form by transforming Grumpy Cat into fondant. Grumpy Cat is one of the most popular Internet cats and currently has her own website, Twitter account and has 1.2 million likes on Facebook. Can you believe it?! 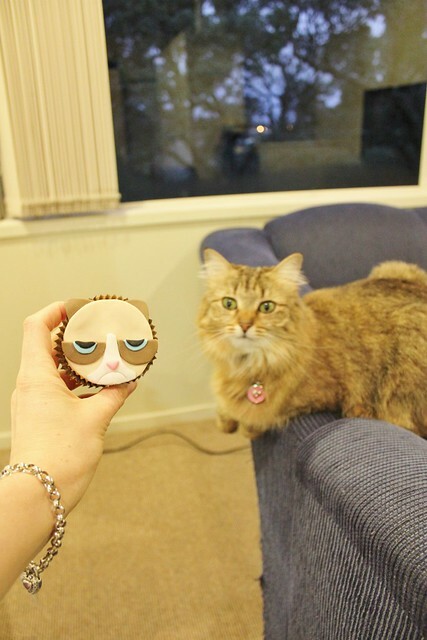 Although Grumpy Cat looks grumpy all the time the truth is she was born looking that way. In fact, her real name is Tardar Sauce! 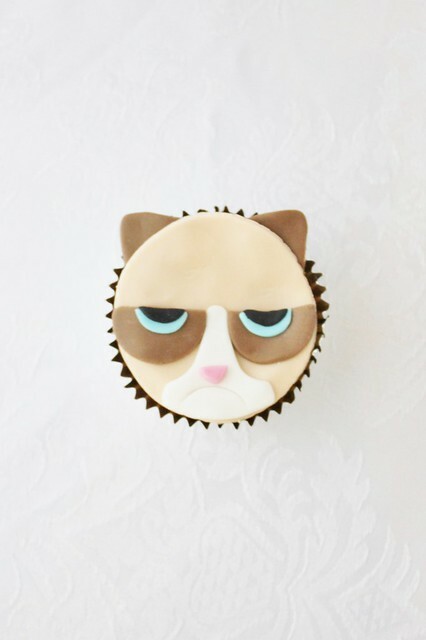 I'm sure Grumpy Cat wouldn't approve of anyone enjoying these cupcakes, having fun making them, eating them or doing anything happy at all, but believe me everyone who bought a Grumpy Cat cupcake to raise funds for the SPCA was super happy! Using gel colours, mix them in to the white fondant to create the appropriate colours. For the cats face I used a skin tone with a bit of brown and yellow for the main part. For the ears and eyes I used brown, for the eye colour I used blue, the nose brown, the pupil black and leave a portion white for the mouth area. 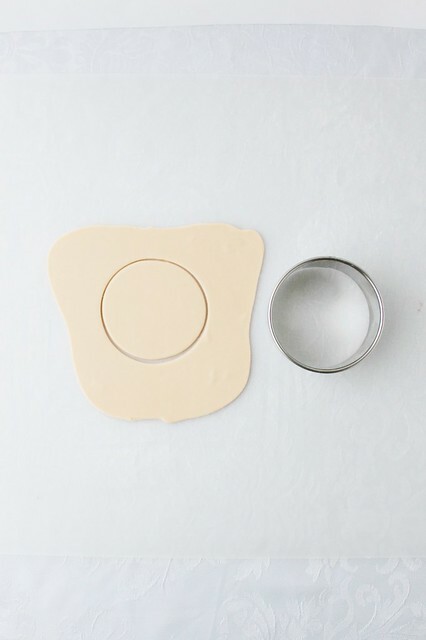 Dust your surface with the icing sugar/corn flour mixture and roll out the skin tone colour, cut out with a large circle cutter, big enough to cover the surface of a cupcake. Now you have the face. 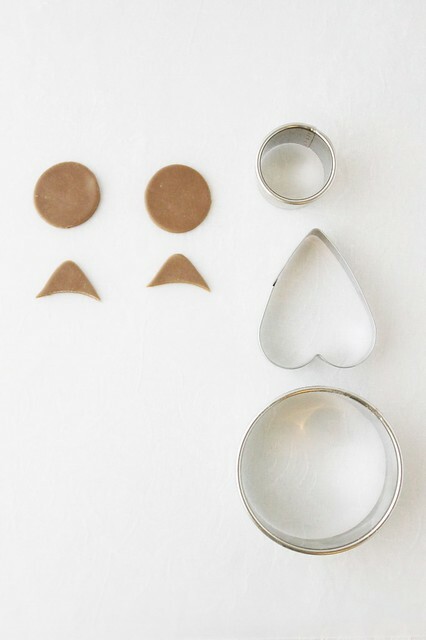 Roll out the brown fondant and cut out two medium sized circles and two hearts. Cut the brown circles in half and cut the bottom third off the hearts. Now you have the eyes and ears. 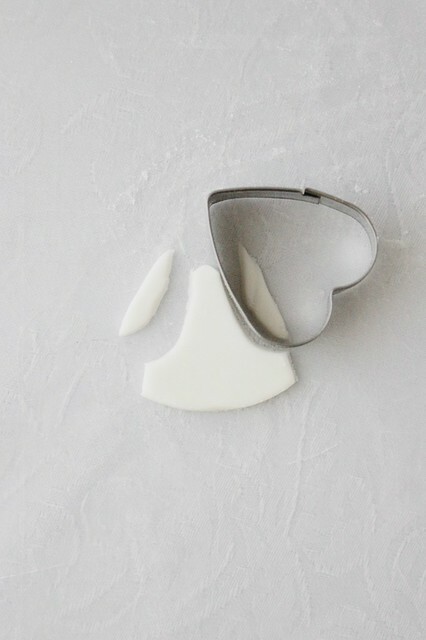 Roll out the white fondant and cut out the heart shape. Using the bottom of the large circle cutter, cut off the bottom of the heart. 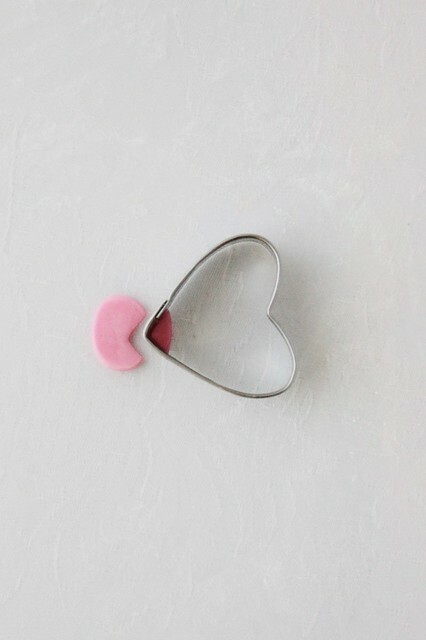 Turn the heart cutter upside down and cut rounds out of the sides. Now you have the mouth area. Roll out the pink fondant and cut out a circle with the smallest cutter. 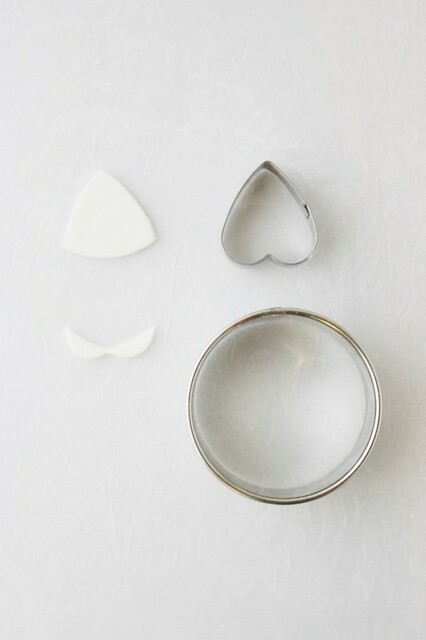 Use the corner of the heart cutter to make the nose shape. Now you have the nose. 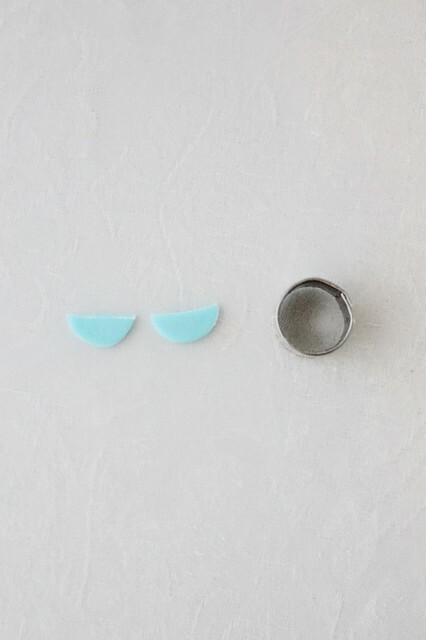 Roll out the blue fondant and cut out small circles using the smallest cutter. Cut these in half. Now you have the eyes. Roll out the black fondant and cut the edge to form a straight line. Using the edge of the smallest circle cutter, cut out a small crescent shape. Now you have the pupils. Ice the cupcakes with a tiny amount of icing so it just covers the top, try not to spread it too thick. Place the two ears on the top of the cupcake so they are overlapping and stick out. 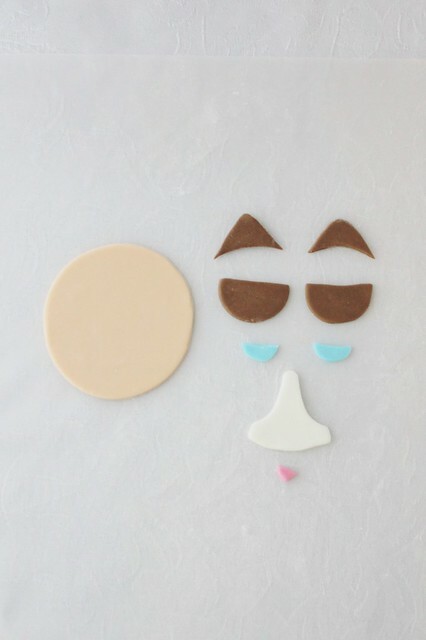 Place the skin tone circle on the cupcake and on top of the ears and smooth out to the edges. Using a tiny amount of vodka, paint the back of the other fondant pieces and stick on. Using the medium sized circle cutter, gently press underneath the nose to make the frown. haha! My sister loves/is grumpy cat. I think I'll have to make her these for her upcoming birthday! This is amazing! 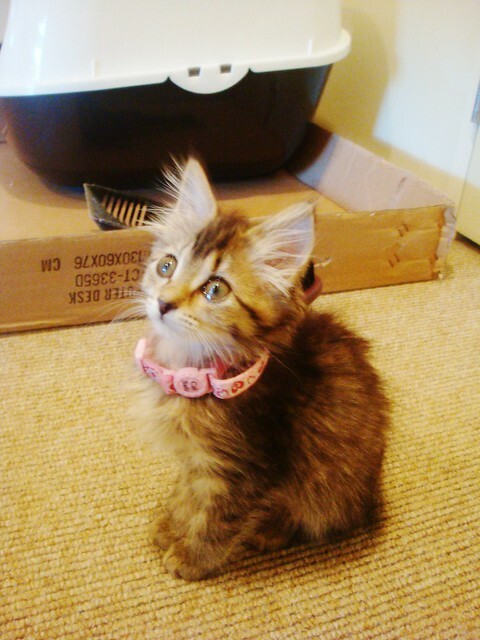 Pecan is such a little cutie.